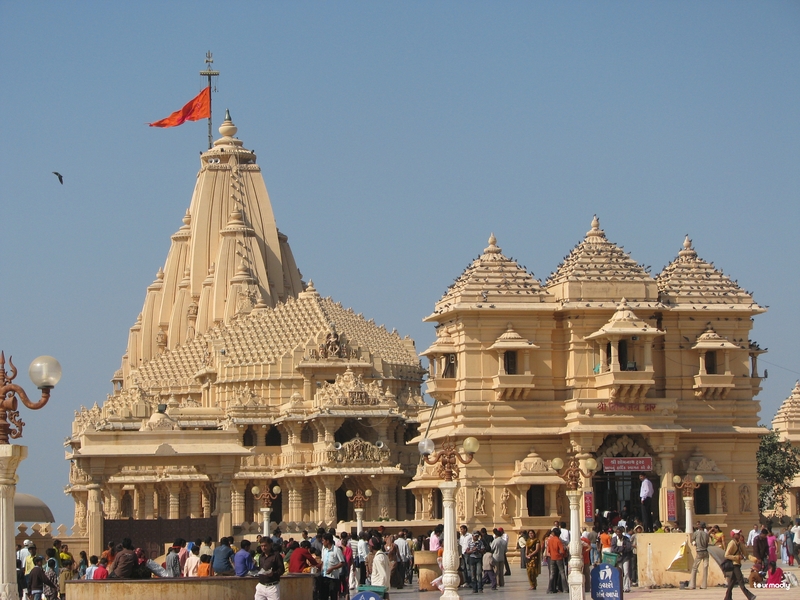 The Dwarka somnath temple tour is one of the main parts of various package tours in the Gujarat state. Both places are visited by millions of tourists, both domestic and international. The places have historical, religious and spiritual significance. The tour package for both these places includes travel expenses hotel fair, welcome drink, sumptuous breakfast and dinner. Our executive receives guests at the airport or railway station as per the package. We board the car to Jamnagar, check into a hotel take welcome drink and after some relax visit the Lakhota lake and Lakhota museum. After lunch we visit the Bala Hanuman temple and end the day in the resort or hotel in Dwarka. The Next day is spent in sightseeing in the Dwarka after a breakfast. We take guests to Dwarka Island, which is at the mouth of the Gulf of katch. Here the guests can soak in the tranquillity and serenity of the place, and visit the Nageshwara temple which is one of the 12 Jyotirling shrines. The visit also includes the trip to port jetty for enjoying its panoramic view. The Gopi Talav, the lake where Gopies were reunited with the Lord Krishna and visit to the Rukmini Devi temple, dedicated to the wife of Lord Krishna completes the visit to Dwarka. Next day after rest at night in the resort we move to Somnath via Porbandar. Along the way the visit to the Tara Mandal planetarium, Kirti Mandir and chowpaty is included. The Tara Mandal is one of the most visited places in the Porbandar. Here the special effect movies are shown on an overhead spherical screen giving an attractive display of all celestial bodies. The Kirti Mandir is also another attraction of the region. The region it is believed is associated with the Sudama the friend of Lord Krishna. At dwarka somnath tour package the place of immense historical and religion value our guest checks in to a resort and enjoys refreshment. The visit to Somnath temple fulfills the spiritual and historical quest of the visitor. The famous temples faced the raids for 17 times in the short period of time in the beginning of the 11th centuary. The Bhalka Tirth temple is also a must visit as it is also linked with Lord Krishna where he accidentally got shot in the foot. After a night stay in the Somnath we take guests to airport and railway station for onward journey.